On December 1, Career Services in partnership with the Office of Undergraduate Affairs within the College of Education and Human Performance, hosted the Fall 2017 Education Career Fair. 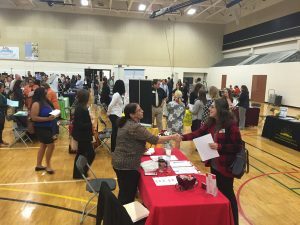 The event gave students interested in teaching an opportunity to meet with recruiters from districts, schools, and other educational organizations. There were 166 students who attended and connected with 42 organizations, many of which hired students on the spot. The Education Career Fair is held once in the spring and fall semesters prior to commencement. For more information on Career Services, visit: career.ucf.edu , or the Office of Undergraduate Affairs at: http://ccie.ucf.edu/ .